A developer has prepared a plan to redevelop the site as a mixed-use project that will include: a micro-brewery, bakery, coffee shop, architectural office space, greenhouse, residential units and performance/meeting space. The Ivywild Neighborhood Urban Renewal Plan was approved by the Colorado Springs City Council on June 28, 2011. The boundaries of the Area include approximately 5.13 acres of land generally defined to include 7 legal parcels plus public rights-of-way. Geographically, it is situated in the Ivywild neighborhood (including the vacant Ivywild School), near the vicinity of Interstate 25 (I-25) and Tejon St, southwest of I-25 and north of Cheyenne Blvd, along a tributary of Fountain Creek, in south central Colorado Springs. The area has long been designated as a Neighborhood Strategy Area by the City of Colorado Springs. The City has improved the infrastructure in the surrounding neighborhood including the construction of a neighborhood park. However, the area around the school and adjacent to Tejon Street is still unimproved and lacks sidewalk, curb, gutter as well as streetlights. The Ivywild School was closed in 2009 by School District #11 and put up for sale. The redevelopment of the school site is a key element in the implementation of the urban renewal plan. A developer has prepared a plan to redevelop the site as a mixed-use project that will include: a micro-brewery, bakery, coffee shop, architectural office space, greenhouse, residential units and performance/meeting space. The school grounds have been redesigned to include vegetable gardens, parking and outdoor gathering spaces for dining and special events. The vision for the urban renewal area is to expand the mixed-use concept that will be initiated on the school into the surrounding area. 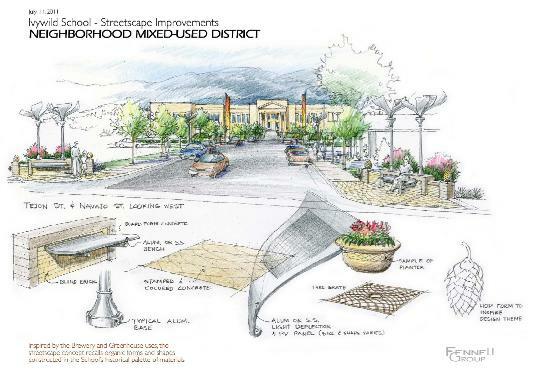 Streetscape improvements on Navajo Street connecting the school to Tejon Street will be implemented by the City through the Community Development block Grant Program. The City also has plans to revamp the intersection of Cheyenne Blvd. and Tejon S. to improve traffic circulation as well as pedestrian safety. Additional retail, residential and office uses will be encouraged along Tejon Street through tax increment financing.